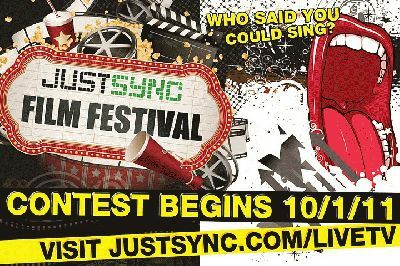 JustSync™ Social Network will launch their “Who Said You Can Sing” vocal competition and the JustSync.com “Short Film Festival” on October 1. The winner of each competition will receive $5,000 and all the videos submitted will run on JustSync’s OMV TV channel. Have you been told you are a great singer? Are you tired of watching all the singing competitions on TV and you’re ready to get in on the action? Let the JustSync.com users weigh in on your vocal ability by uploading a five-minute video of you to singing a song by a known artist (not your own song), directly to JustSync.com. Solo acts, duets and group performances are welcome. To increase your chances of winning, have your family and friends visit JustSync.com to vote for your video. The more votes, the more chances one has to win the $5,000 dollar cash prize. Submit your video starting October 1 and no later than November 1, 2011. Voting begins November 2, 2011 and ends on January 2, 2012. The “Who Said You Can Sing” winners will be announced the following week. The JustSync.com Short Film Festival was created to showcase the work of up-and-coming filmmakers nationwide. Narrative, documentary, animated, and screenplays are the genres accepted for the JustSync Short Film Festival and will compete among themselves as one category. The maximum running time for short film submission is 20 minutes and must be submitted from October 1 to November 1, 2011. Voting will begin on November 2, 2011 and ends on February 29, 2012. Winners will be announced the following week. In addition to JustSync’s new contests, their new Supersite™ provides social networking and location based mobile applications to simplify, synchronize and add entertainment value to your social networks. JustSync also allows subscribers to be the entertainer by “Syncasting™” (privately sharing your actions through JustSync) your music playlists, comments on places you visit and more to your network. JustSync’s non-intrusive approach to social networking, entertains their users with positive news, music, movies, Social Lifestyle™ applications and more. “What links people together goes beyond their short online profile. We’ve created these fun competitions so that JustSync users can entertain and connect with others based on their unique talents. We look forward to welcoming new JustSync.com users who would like to share their vocal and filmmaking abilities,” says JustSync Spokesperson Damion Daniel who is an award-winning DJ himself who has toured with international recording artists, hosted popular radio shows and produces electronic dance music.